REVERE, Mass. - Police have arrested between 10 and 12 people after a large disturbance broke out at a suburban Boston beach. 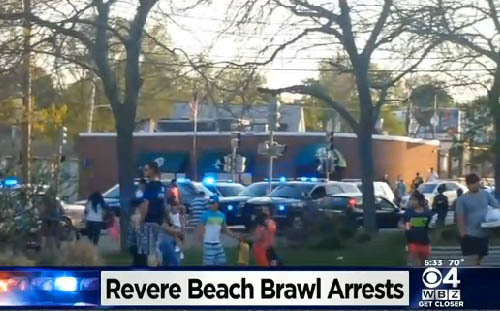 Dozens of police cruisers from surrounding areas made their way to Revere Beach at about 6:15 p.m. Sunday in response to a brawl that resulted in road closures. Prosecutors say some of those arrested on disorderly conduct charges may be arraigned Monday. State Police Lt. Dan Richard says those involved in the fight were "pushing and shoving and throwing bottles." He says the bottles were likely plastic soda bottles. He says the melee was apparently sparked by a group of young people drinking and perhaps smoking marijuana and disturbing nearby families. Police say between 100 and 200 people were at the scene. No injuries were reported and no names were released.